Facebook video calling plugin should be installed on your Windows or MAC system to use video calling feature on facebook. We have already seen easy Facebook video calling setup procedure. Once you download and install this small plugin (from Skype), you can video chat with Facebook friends online within web browsers. However, if you do not want video calling feature and previously set it up – you can easily uninstall and remove Facebook video calling plugin from your Windows PC to get rid of video calling feature. 1. 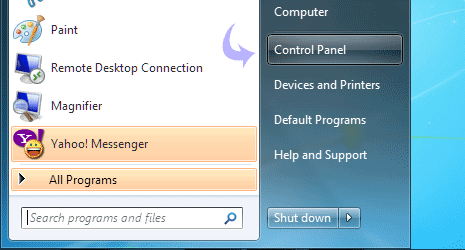 On your Windows computer, click Start button and then click the Control Panel option. This will open Control Panel window with lot of option icons. 2. 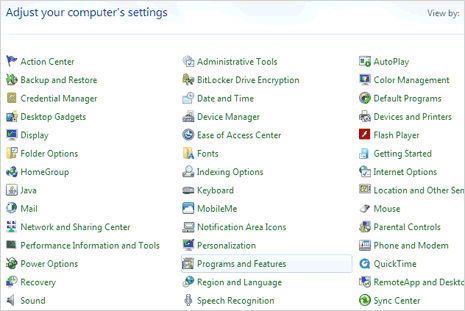 Click on Programs and Features icon in the Control Panel window. This will open ‘uninstall or change a program’ window with listing of currently installed programs on your computer. 3. Look for ‘Facebook video calling’ in the displayed list of programs. Right click on it and then click uninstall button. 4. Then click Yes button on the confirmation screen. Facebook video calling plugin will uninstall automatically and will be removed from your Windows PC. You can confirm on it by opening ‘Programs and Features’ windows again, there should be no lisitng of ‘Facebook video calling’ in the list of installed program. 1. Goto your Home directory labeled with house icon and username in the Finder. Then open the ‘Library’ folder. 2. Now open the ‘Internet Plug-Ins’ folder and delete the FacebookVideoCalling.bundle file. 3. Again repeat step 1 above and open the ‘Library’ folder. There open ‘application support’ folder and then open ‘facebook’ folder. Then delete ‘video’ folder to free up some space on your MAC OSX system. I never ran the exe file. But my fb still shows all the crazy video icons. I wish for that to go away and not have those buttons anymore. I cannot find any way to do that. Ideas? Me also, i’ve never downloaded that video chat. i simply go to this website “www.facebook.com/videocall?ing” and my chat becomes weird. DAMN! IT MAKES ME CRAZY!